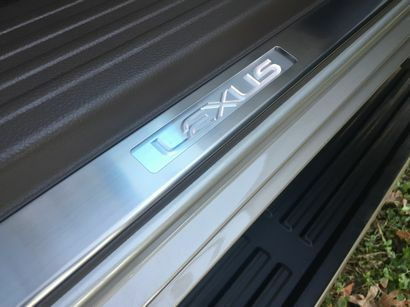 The Lexus GX 460 shares its platform architecture with two other models from the Japanese manufacturer – the more utilitarian 4Runner and the recently retired Toyota FJ Cruiser. The current generation GX460 was introduced in 2009 as a 2010 model. 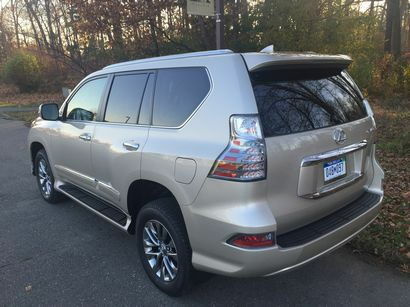 Since Toyota vehicles typically run on a 7-year model cycle, the GX's 2014 re-do consisted mainly of cosmetic tweaks. Upfront there's a new fascia with the brand's signature Spindle grille with standard LED headlamps and available LED fog lamps. Unlike the NX or recently-introduced 2016 RX, there's not much going along the sides save for a front fender character line, a wide lower body-side molding and a big lower side step. Per the 2014 refresh, the taillight housings are now clear along with a redesigned bumper that offers a nice low lift-over for loading and unloading. 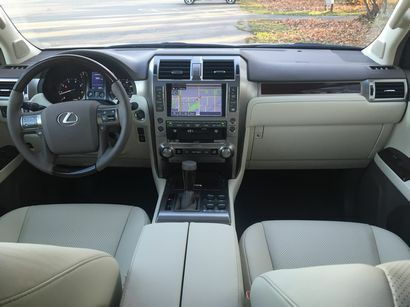 Inside, the GX offers up everything expected in a luxury utility vehicle with navigation, adaptive variable suspension, moonroof, proximity key with push button start, heated mahogany wood steering wheel, rain-sensing wipers, and power heated and ventilated multi-adjustable memory front seats all standard. The dashboard clock is GPS-enabled for reset-free cross-time zone travel. The gauges and knobs are large, easy to read and intuitive to use. Instrumentation features a speedometer, tachometer and scrolling center screen with display features ranging from outside temperature to average fuel consumption. The 8-inch touch-screen display features a bright backup monitor and there are redundant buttons for most of the major functions. 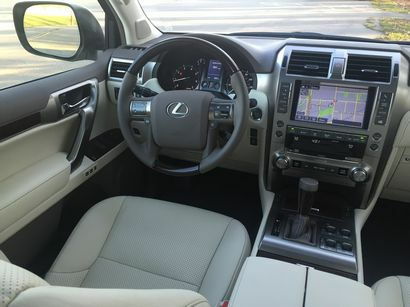 Due to the need to locate the various suspension and 4WD controls on the console, unlike other Lexus models the GX lacks the at-times frustrating infotainment mouse controller. Huzzah! Because it's body-on-frame, getting into the GX isn't as easy as a crossover. Fortunately, those large, illuminated running boards and assist grips come to the rescue. 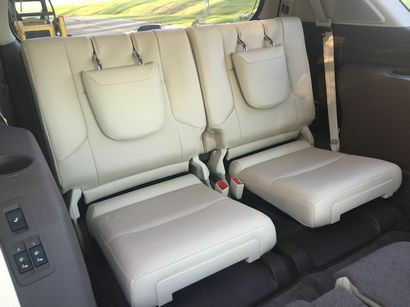 Once ensconced in the nicely-bolstered soft aniline leather-covered seats, we found plenty of leg, shoulder and head room for 2 adults up front and three in the middle seat. The steering wheel has a power tilt and telescope, while all controls are within easy reach of the driver. The power-folding third seat, however, is best left for small children. Getting in and out requires a great deal of contorting and, once seated, there's very little in the way of head, hip or leg room. That third row also takes up what could be a lot of usable storage space and, when deployed, the amount of cargo space behind it is laughable. 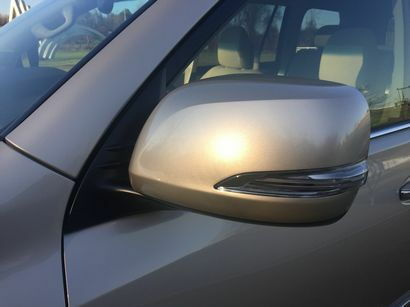 Another issue we have is that the rear door is hinged on the right side and swings out, rather than swinging up – which can make opening it and closing it difficult if you're parked in a tight space. Fortunately, the rear window opens up independently of the hatch and flips up, allowing for loading and unloading without having to deal with the swing-out door. A fairly high beltline and comparatively low roofline make the side windows and the windshield relatively narrow. Despite this, the view out the front and sides is excellent. Even the rear three-quarters view is very good as there's a good-sized window between the C- and D-pillars. Besides, a standard rear backup camera is displayed on the large touch screen. The only engine offered is an all aluminum 4.6-liter 1UR-FE DOHC V8 generating 301 horsepower at 5,500 rpm and 329 lb.-ft. of torque at 3,500 rpm mated to a 6-speed automatic transmission. 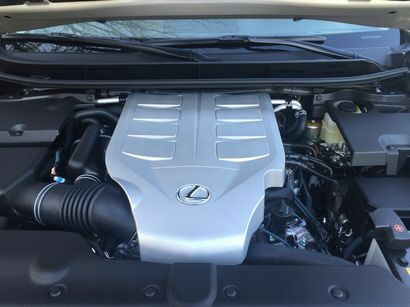 Fuel economy isn't bad considering the GX460 is a mid-size body-on-frame SUV weighing nearly 5,200 pounds. The EPA rates it at 15/20/17 city/highway/combined mpg, while our own observed fuel economy was 21.5 mpg on the highway and 13.5 mpg in the city. The good news is that the V8 only requires regular fuel. The suspension consists of a double wishbone independent setup with coilover shocks and a stabilizer bar up front, while the solid rear axle is located by a four-link suspension that, on Luxury models, is equipped with an Adaptive Variable Suspension system with adjustable height control. 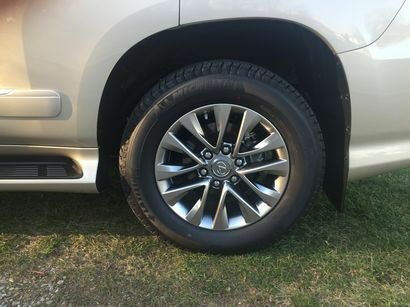 18-inch wheels are standard and are wrapped in either Bridgestone or Michelin (on our tester P265/60R18 mud and snow tires. There's also a full-size alloy spare. Ground clearance is 8.1 inches while approach and departure angles are 21 degrees and 23 degrees, respectively. Maximum towing capacity (rated using SAE towing standard J2807) for those so inclined and with the optional Class Four receiver hitch is a robust 6,500 pounds. An overall height of 73.8 inches and 8.1 inches of ground clearance with a concurrent high center of gravity should translate into a fair amount of body motion, and it does. 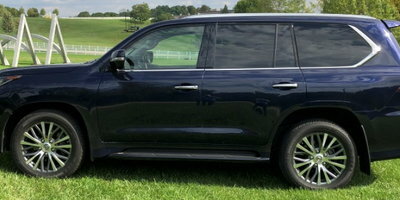 But the GX460's handling ultimately feels very secure – no doubt aided by its meticulously-tuned stability control system. The body leans in corners but it's well controlled. Occupants are whisked serenely over potholes and road imperfections. If things start to get bouncy over uneven road surfaces, simply switch the suspension to "Sport" for a bit more firmness. 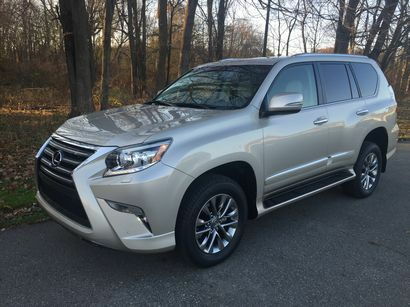 At high speeds the GX460 tracks nicely down the road and, despite its boxy shape, is not affected by crosswinds. 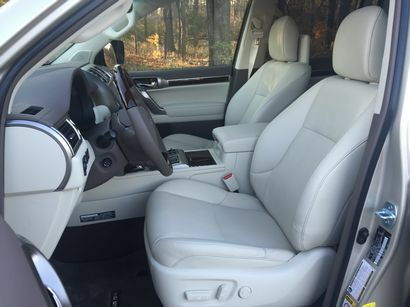 The cabin sound levels are one of its high points – the interior is serenity exemplified. 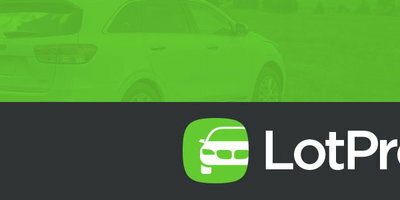 Even traveling down the expressway at over 70 miles per, engine sounds are muted and very little in the way of wind, road or tire noise reaches the interior. 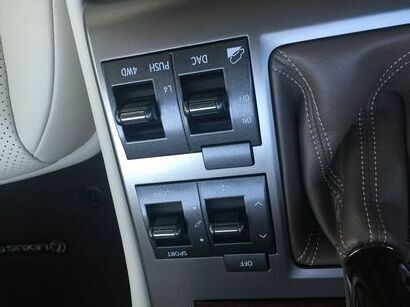 While it could use a little more steering feedback, braking performance is outstanding – they're easy to modulate and provide excellent feedback through the brake pedal. Considering the size of this truck-based SUV, it's also surprising that there's no noticeable nosedive during hard braking. 2016 GX460 pricing starts at $50,425 for a base (if you can call it that) model, including delivery fees, and can top out at over $70,000 for a fully-optioned and accessorized Luxury model. Our Satin Cashmere Luxury tester had a base price of $61,515. 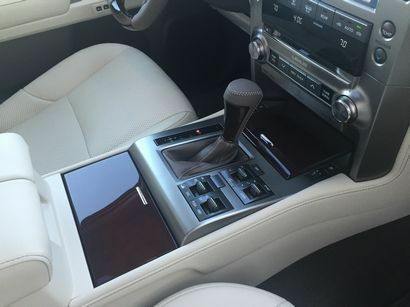 The addition of a $1,145 Mark Levinson Premium Audio system and a $1,970 rear-seat entertainment system, plus $940 for delivery, processing and handling brought the total MSRP to $65,570. 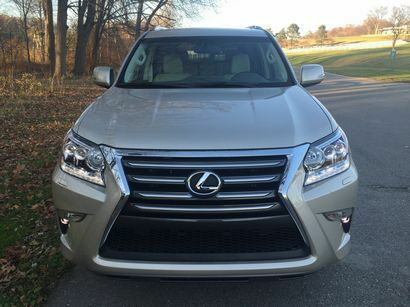 We are convinced that there's a lot to like about the 2016 Lexus GX460. 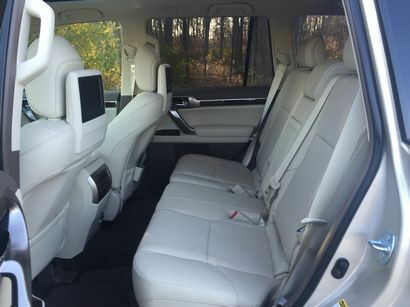 It comes standard with loads of luxury features, a near-library quiet interior, good driver visibility and plenty of room for five adults (plus 2 kids in back) with decent fuel economy for its size. Not only is it a great highway cruiser, it is also a commanding presence in city driving – its high-profile tires soaking up pavement irregularities and huge potholes with ease. On the other hand, it's handling, though secure, hardly inspires us to hit the back roads, it's styling is dated by Lexus standards, while its side-hinged rear door is an anachronism. 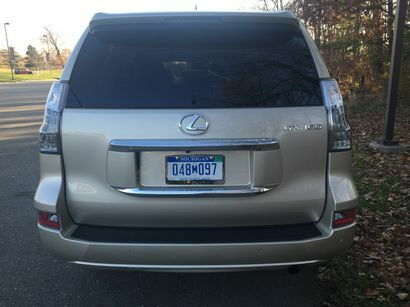 But in the end, the Lexus GX 460 remains the consummate midsize luxury body-on-frame sport utility cruiser – quiet and quick while eating up freeway miles and soaking up road irregularities on both the highway and in the city better than any other large SUV we have ever driven. Throw in its legendary dealer experience and reliability and you have a combination that's hard to beat.